Duration: 24 sec. per ep. There are 12 companion pieces in the forms of "Fact Files" (which expand upon a given character from a corresponding episode) airing shortly after each episode. From studio Trigger comes a very helpful survival guide for the insanely popular and excellent Inferno Cop. 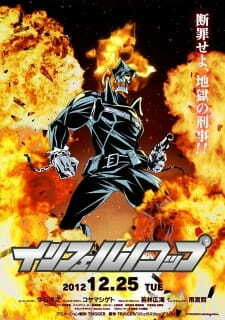 It gives extremely thorough explanations on the interesting and well-developed characters in the Inferno Cop universe. It felt like I was taking a class at a university. Finishing the "Fact Files" series left me feeling as if I had graduated from Inferno Cop university. There isn't any real story here, but Inferno Cop: Fact Files helps to reinforce Inferno Cop's already enthralling story. An absolute must-watch for any rabid fan of Inferno Cop, or anyone learning how to worldbuild. Every episode, or "Fact File," we are introduced to the same host. He is wonderfully animated and looks equal to all of Vincent van Gogh's works combined. We also see the episode the Fact File is based on and it looks gorgeous. Anyone looking to improve their art style, look no further. Every time a Fact File starts, they play "INFERNO COP: FACT FILE!" and it's stunningly beautiful. Throughout the whole Fact File, they play a remix of the narrator saying "Inferno Cop: Fact File!" and it's a magical experience. The voice acting is absolutely spot-on. In essence, a Fact File describes a character from the Inferno Cop universe. The characters are already amazing, relatable, and well-developed, but Inferno Cop: Fact Files goes the extra mile and gives us extremely well-done exposition. Overall, Inferno Cop: Fact Files is a masterpiece, fitting for it's parent show, Inferno Cop, which is also a masterpiece. Honestly I thought the fact files at the end of Inferno Cop were funnier than the main show. The main show feels a lot like a Japanese take on Adult Swim humor, which is fine but not my favorite thing. However these felt a little stranger than that. The Fact Files are pretty much one joke repeated over and over, but I got a pretty good laugh every time when they would reveal some stupid little detail about a bit character and the chugging Fact File remix soundtrack puts me in a good mood every time I hear it. You can't watch them in isolation from the main show, but they provided for me, some of the biggest laughs for Inferno Cop. There’s not much to say about this. It’s pretty entertaining if you enjoyed Inferno Cop. I watched it after I had finished Inferno Cop rather than in between the episodes which slightly detracted from it, but the explanations were still very entertaining. If you haven't seen Inferno Cop yet I'd recommend watching the Fact Files after every episode because it ties in well with the rest of the story. I mainly enjoyed it because it gave me more to watch about Inferno Cop. I’d give it a watch if you enjoyed Inferno Cop and want to add to the “lore” of the universe. My personal favorite fact files are Fact File 03 (Mr. Judge) and Fact File 05 (Mecha Cop).